The first thing that struck me as I walked into the legendary Preservation Hall jazz venue in New Orleans, Louisiana, was how tiny it was. It is, in essence, the size of an average living room. The place accommodates about one hundred people. Around forty of those can sit on the floor or on wooden benches, while the rest simply stand. The stage – if indeed it can be called a “stage” – accommodates the band in tight proximity to each other and to the crowd. There is no air conditioning, just a few fans blowing hot air around. As you might imagine, it is not entirely comfortable. And that’s just the way it should be. I had long wanted to visit the iconic venue established in 1961 to maintain and honor the history of New Orleans music and culture. It feels as authentic as I had imagined, even while catering to the big number of tourists waiting in line outside to see the 8pm show of the Preservation Hall Jazz Masters featuring Leroy Jones on May 4th, 2015. As we made our way into the cramped quarters, I was immediately enthusiastic for what was to come, if mildly worried about the space and how the band would sound: In an ideal scenario, the group would be perfectly attuned to the hall’s acoustics. But they could also play too loud for such a small area, rendering the evening a disaster. I needn’t be concerned. As the band walked in and went into the first few bars of “Bogalusa Strut,” it was clear they not only were amazing musicians, but the sound was pristine. You could hear every single detail, and what’s even more incredible, the crowd maintained a respectful silence throughout which I’m frankly not used to. Perhaps it’s because I was in The Big Easy and not in my regular turf of South Florida, but damn if everyone wasn’t on their best behavior – visitors and locals alike. A show can be easily spoiled by a rude audience, so this was a welcome surprise. Not only is the venue sublimely cozy and informal, it was a joy to watch the band members themselves so in tune with one another. You could see it as pianist Meghan Swartz and bassist Jason Stewart glanced at each other while they played, or as trombonist Katja Toivola looked over with a smile at tenor saxophonist’s Daniel “Weenie” Farrow’s mellow soloing. You could feel it as drummer Dwayne Nelson laid on the groove and the rest of the band followed the beat with their heads, hands or feet. 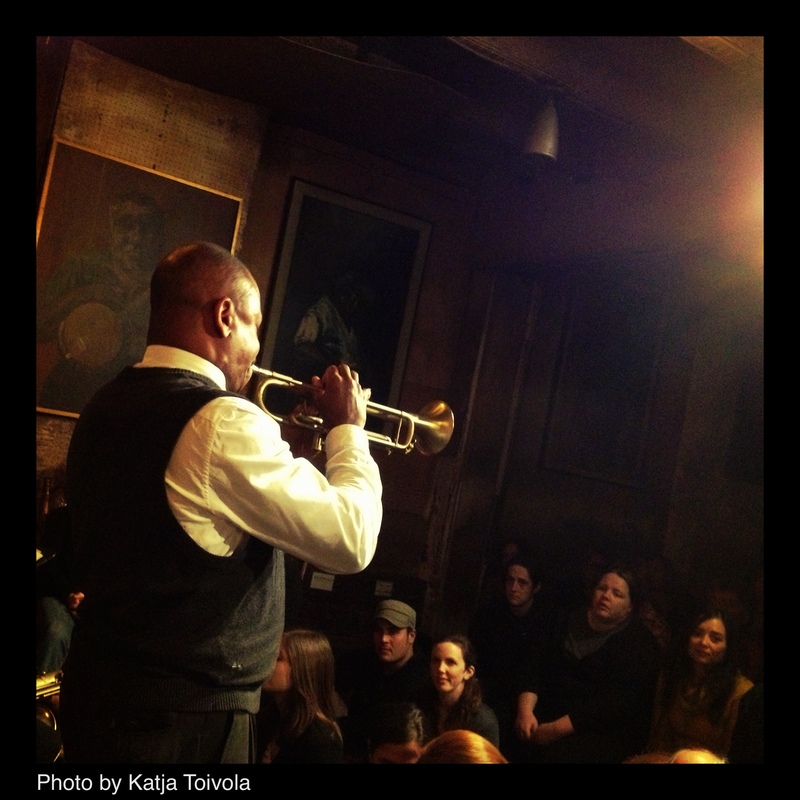 And you could definitely dig the feel-good vibe as trumpeter Leroy Jones introduced each jazz standard with a grin. Jones is a celebrity of the New Orleans jazz scene – he’s been a band leader since the age of twelve and has played with the Harry Connick Orchestra, among others – and you can easily see why: He has an easygoing manner that immediately endeared him to the crowd, and his trumpet playing is crystal clear and emotional. On two occasions he also sang (on the songs “Baby Face” and the beautiful “Baby Won’t You Please Come Home”), and although his voice got a little lost among the instrumentation, his passion for the music was obvious from his beaming face. More so than any other type of music, traditional jazz is a collaborative effort. The strength of a composition lies not in a particular songwriter or on grandiose displays of performance – there are no stars vying for attention. Instead, its power is in the collective, in how the band states the main motif together and then develops it through individual improvisation. When each member of the group goes into his or her solo, the rest of the ensemble takes a step back, contributing when necessary but mainly giving their bandmate freedom to explore. It is a beautiful thing.